“Cloud Forest” of Monteverde. 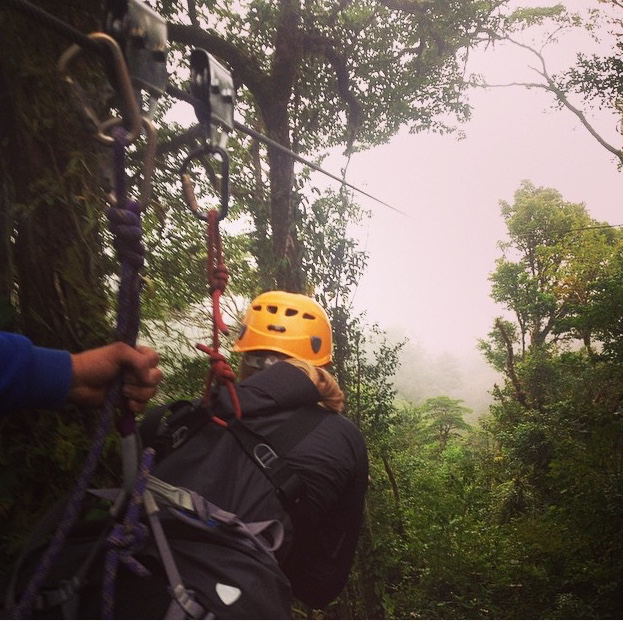 Believe me, there is no better place to experience a zip line than up in the clouds!!! 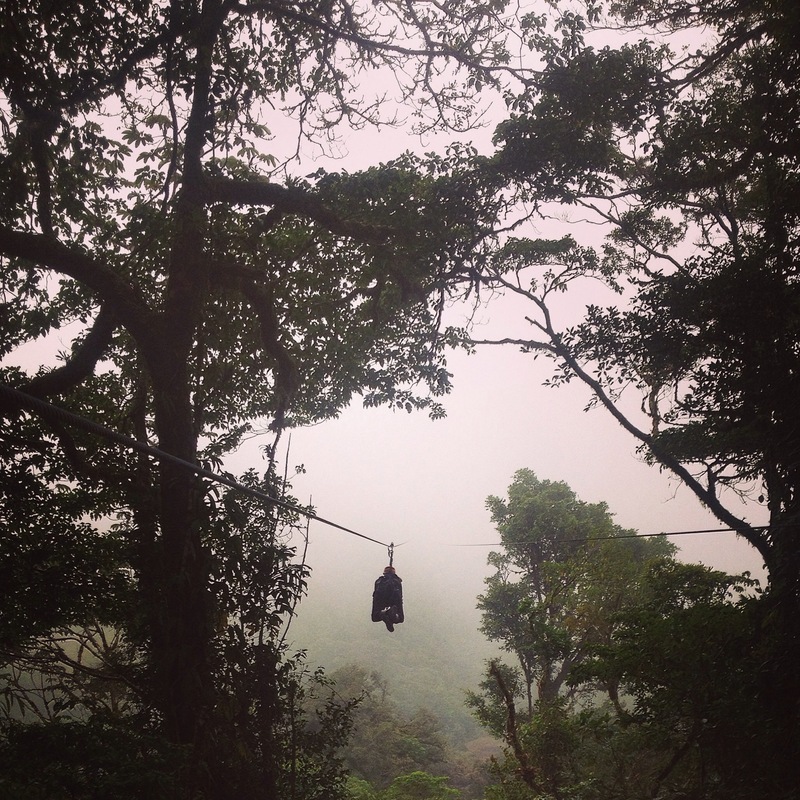 100% Aventura has the longest zip line in Latin America measuring 1.5 Kilometers. Just take my advice. If you ever make it to this region of Costa Rica, no matter your age, you must do this. I didn’t take a whole lot of pictures because having an iPhone without a strap is a dangerous thing. Let’s face it. 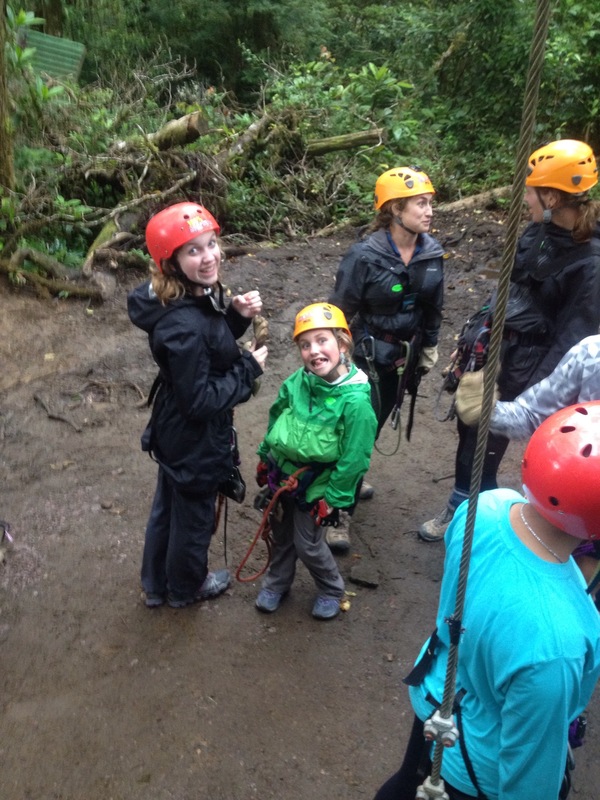 You won’t see it ever again – gobbled up by the cloud forest below. Plus, I just wanted to be in the moment. 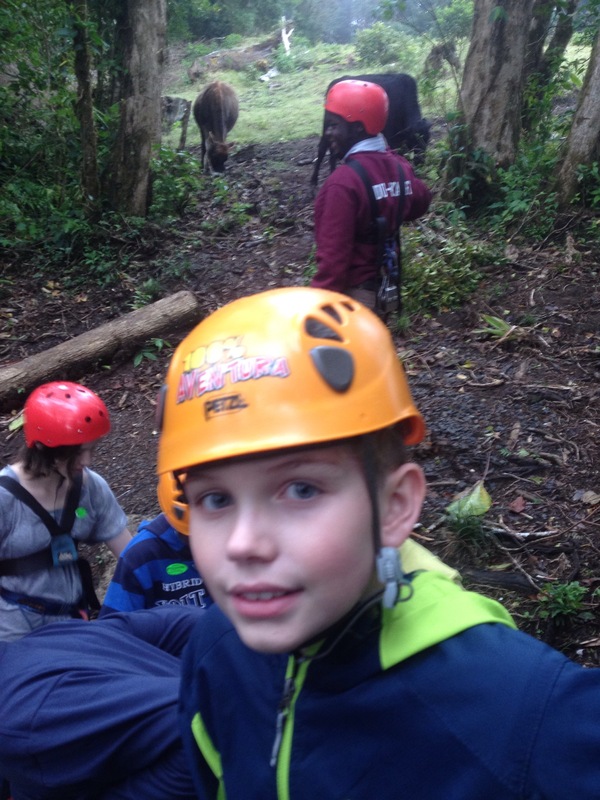 We started out with some really short and easy zips, including a rapel from a tree. 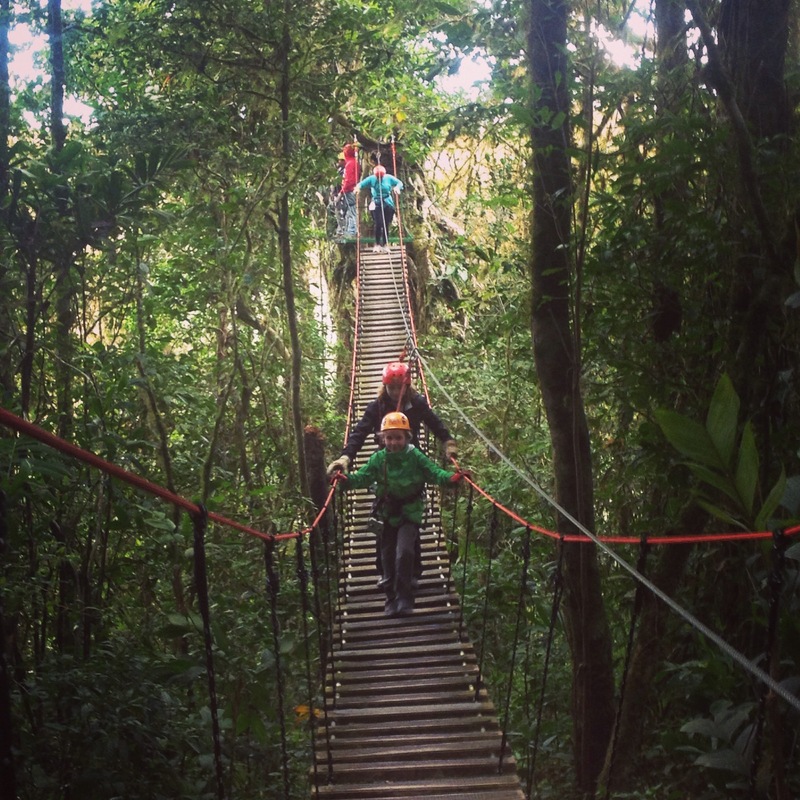 Walking across a hanging bridge? No problem. This was the easy part. Charlotte and Piper were paired up for some of the longer zips because of Piper’s weight. Some are so long that had she not been paired up, she’d zip out to the middle and get stuck which would require a rescue. In the next two pictures I am waiting my turn to do the Superman zip. This is where you can really feel like you are flying. Charlotte and Piper wait their turn, and Finn is just behind me. Notice the cows in the background. I think they want a turn too! Here we go. A student is just in front of me getting hooked up. She’s ready to fly into the mist! Charlotte, Finn and Piper were all too small to do the Superman Zip but experienced it sitting up with partners. 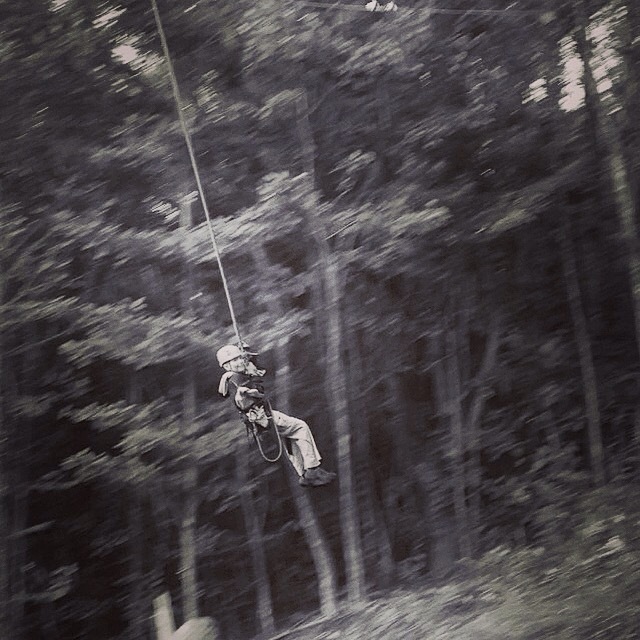 They did take the challenge of the Tarzan Swing at the end of the course. A giant step off the edge and you’re plunging, then swinging with all your friends cheering you on below. It’s quite a rush. It’s already been suggested that my kids need to skydive next. It’s been a whirlwind of a journey from New Zealand, to Wisconsin, to Miami and now Costa Rica. Sometimes I can’t even believe I’m here. Is this for real? If it weren’t for Jamie, we wouldn’t be here. His job is the reason we are traveling around the world with our kids and for this we are thankful. 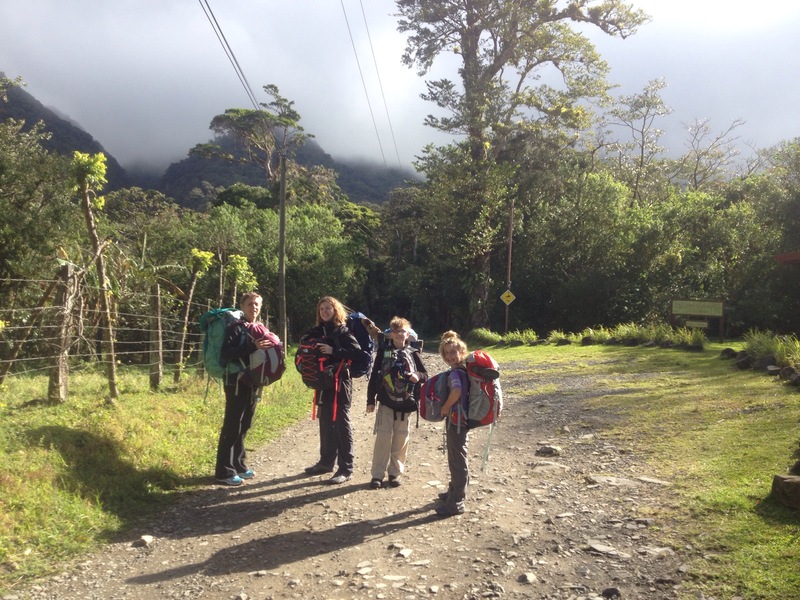 And so here we are, ready to go on a one month long excursion with the ninth and tenth graders of Think Global School. 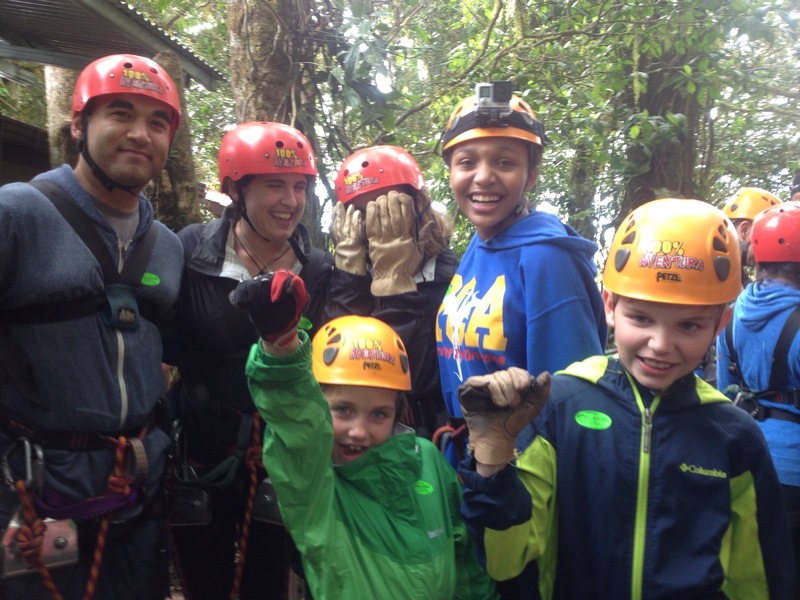 Broadreach is the organization taking us on our journey, beginning in Monteverde. We’ll be moving around the country, fully experiencing the diversity of the land, it’s climates, it’s plants and animals and of course, learning about another culture through the people we meet along the way.